This episode is a little different than “Pirate Treasure,” in that it does not explicitly revolve around a specific lesson. Rather, it discusses the subject of fear quite subtly by wrapping it around a story about good peer pressure. Usually, peer pressure is when someone’s friends try to get them to do something that they don’t want to do. The phrase is usually regarded as negative, often used in conjunction with things like smoking, drugs, drinking, etc. But positive peer pressure occurs more often than most people tend to realize, since it almost always occurs only when dealing with true friends – those who have your best interests at heart, and treat you and your decisions with respect. It can be something as simple as being convinced to ride that new rollercoaster, or to mail in an application for that job you’re not sure you’ll get. Being a rather complicated subject, The Backyardigans and other children’s shows use this sort of peer pressure mostly when dealing with courage and feats of inner strength. 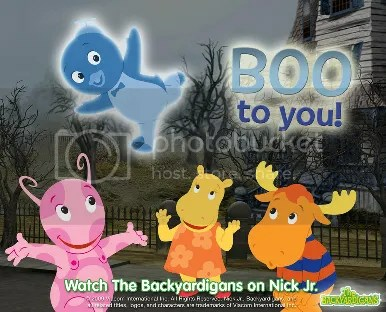 Tyrone becomes the main focus of this episode when Pablo and Uniqua decide the day’s activity should be pretending to be ghosts. More than just dressing up in a sheet [which is spoofed later on], ghosts fly, go “Woooo…”, and walk through walls. Tyrone, however, isn’t feeling very confident about this game. Ghosts are “spooky” and make him “nervous” (interestingly, those terms are used instead of “scary” and “scared,” respectively). His friends show him with a toe-tapping song-and-dance number that being a ghost is great (title drop! ), and he ought to join in the fun. It’s important to point out that Tyrone does want to play and that it’s his lack of self-confidence that is primarily hampering him. He believes his fear of ghosts prevents him from performing well, and that the others will think less of him if he fails. Of course, being true friends, Pablo and Uniqua are very understanding, and gently encourage him to do his best. The episode continues in a slightly predictable way, with Pablo and Uniqua excitedly showing off their ghostly abilities and Tyrone nervously sticking his hands in his (non-existent) pockets. It’s also the first appearance of Tasha (if you’re following either these reviews or the DVD releases), who is a bit more “girly” than Uniqua, though with an equally fierce independence streak. Her role is the unsuspecting stranger who wanders into the “haunted” house to be scared by our friendly ghosts, but much to their surprise, she’s not afraid of anything. Not unexpectedly, Tyrone is the only one who is able to scare her in the end, thus gaining self-confidence as well as taking Tasha’s arrogance down a peg or two. This scaring business is performed all in good fun, though you may need to explain to your child the difference between scaring for malicious purposes and “fun” scaring done just to surprise others, not to truly frighten them (especially if all parties are fine with it). Dealing with fear in this episode is helped by the 1920’s jazz music, done in the style of Cab Calloway. The songs are made for foot-tappin’, finger-snappin’, and all-around swingin’ amusement. “What’s So Scary About That?” is a particularly good tune for kids when they feel scared, and “Hide-and-Go Boo” is not only a silly song to sing, but can be a very entertaining game to play! How do you and your child deal with fear or peer pressure [good and bad]? VeggieTales in the House: A Very Silly Update?